One of the best-kept secrets in Hawaii is this beautiful B&B. Considered the top location on the island of Oahu, in Kailua /Lanikai, this special getaway will make you feel that you are in another world. Hawaii's Hidden Hideaway is ideal for that special occasion, for honeymooners, on business, or families. Located on a quite street. 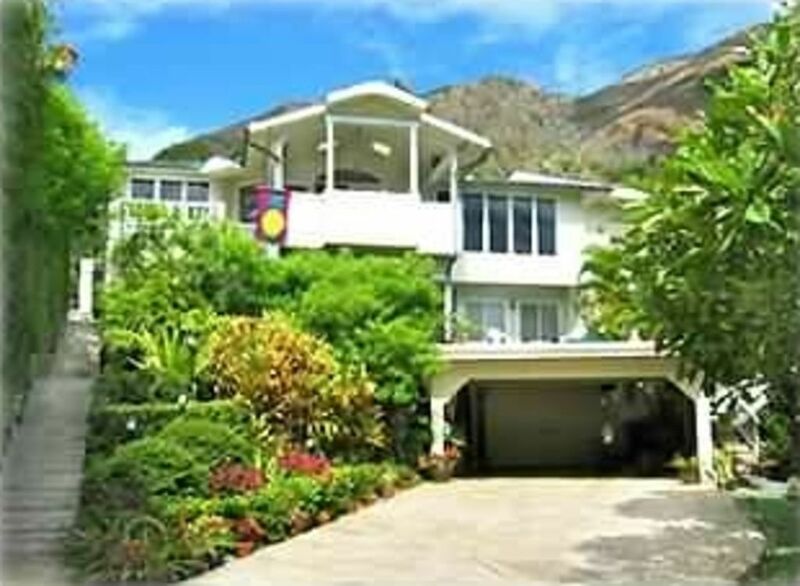 Only a short walk (2 blocks) to the world famous Lanikai and Kailua Beaches. Watch the sunrise, listen to the ocean on a quiet night, or walk on the beach as the moon rises between the islands. This distinctive spot is only 30-minutes from Waikiki, Honolulu or the airport. Five minutes from the town of Kailua are great restaurants, antique shops, and rentals for kayaks and windsurfing. There are three bedrooms that have their own entrances. and kitchenettes (fridge, microwave, coffee maker, blender, toaster, hot plate, all the dishes and pots and pans). There is a private outdoor jacuzzi off of the suite. FREE off street parking, FREE cable TV, FREE WiFi, clock radios, ceiling fans, dining area, laundry facility, out door shower and much more . Chose from king, queen, or twin accommodations (bedrooms can be adjoining) A welcome breakfast of tropical juices, cereals, pastries, yogurt, fruits, coffee, teas, and surprises is provided. Also included is a library of activities on the island, restaurant menus, and books on Hawaiian birds and flowers. This establishment is filled with “aloha spirit” and has many repeat guests that enjoy the paradise of Hawaii. Notes: Minimum stay 3 nights. A permitted legal establishment (#90/BB-0109), (GET /TAT W00579726-01). We have been operating this beautiful establishment for over 20 years and want to make sure that everyone feels at home in this quiet area of the island and enjoys Hawaii to the fullest. You will feel at home here and relax in your private hideaway. You have everything you need. We are in the best location to be close to EVERYTHING and yet private and quiet. We are close to the ocean, hikes and 7 golf courses. Plus Kailua town is only 5 minutes away with great restaurants. Enjoy a glass of wine or your favorite refreshment on your lanai. Kailua town is just a 5 minute drive away with lots of restaurants and shopping. Just a couple of blocks from the World Famous Lanikai Beach. Beautiful sunrises and spectacular Full moon rises over the ocean. Each unit has a dining area for two. We have snorkel gear, buggie boards and beach toys. Private Jacuzzi for the Suite only. The best place we could have stayed st. Had everything. We will be back. Thank you for staying with us. We are thrilled that you enjoyed yourself and sharing what we offer. We look forward to your next visit. We have stayed at many B&B, but this is one of our favorites. It was nice that we could have just one of the units. It had everything we needed, location, very comfortable, it had everything we needed, down to scissors, and paper clips. We appreciated the book on all the local restaurants, so we knew about them before we got there. Having breakfast at our leisure was special, after coming back from an early walk on the beach to see the sunrise. Plus everything was private for us. We will be back and recommend this to everyone, friends and family. . Thoroughly enjoyed our stay. Lanakai is a magical area and we had a blast exploring, there’s a lot to do on Oahu. We came from Texas and stayed six nights which is not long enough to adjust to the time and to get real relaxed, so next time we hope to stay longer. The house had everything we needed! Very close to the beach. Thank you Janice for the hospitality! More than we could have asked for. This was the BEST stay of all our time in Hawaii. Perfect accommodations, perfect location and perfect host. We so look forward to our next trip back and we will stay here AGAIN. You can not go wrong with this wonderful place. This is a wonderful hideaway. We took all three rooms for our party of six. Each room is unique and exceptionally well equipped with everything you need and everything you forgot you needed. The little touches are a lot of fun. Just roll off the plane with your swimsuit, you do not need anything else. As foreigners were really enjoyed walking around the neighbourhood. It is a peaceful escape from Honolulu, people drive slowly and the community clearly care and love their homes and streets. The beach is glorious! Also exceptionally clean. Janice is a wonderful host. We can not say enough wonderful things about this great place in paradise. We had everything we wanted and more. We have stayed in a lot of B&Bs around the world and we have to say that this is one of the best. If you are not happy here you are not happy anywhere. We recommend this to family, friends and just about everyone. We will be back and looking forward to the next time. Beach activities, , Shopping, Great Hikes and 7 Golf courses close by, Great Restaurants. Must see Pearl Harbor, Arizona Memorial, USS Missouri, Pacific Aviation Museum, Byodo-In Temple, Sea Life Park, and go to a Luau. Just a leisure drive around the island is always fun and stop for an afternoon of snorkeling or go on a scuba dive. There are great hikes in the area, one which is right behind the house, or paddle out in a kayak to the Mokolua Island. For an early romantic morning watch the sun rise in front of you on Lanikai beach. For a romantic evening, watch the full moon rise over the ocean, right on Lanikai beach, just a stroll from the B&B. 3 Night minimum stay (longer stay required for Holidays) .